Border police would be given the powers to stop and detain suspected foreign intelligence agents if a new bill passes through parliament. The new powers targeting "hostile state activity" would be similar to those used against suspected terrorists. The Home Office introduced the bill in response to the attack in Salisbury on Sergei and Yulia Skripal. 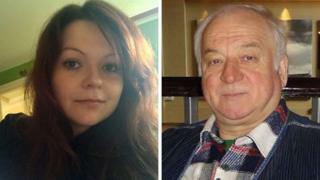 Home Secretary Sajid Javid said it was "highly likely" the Russian state poisoned the pair, which Russia denies. He said the attack demonstrated why the police "need robust powers to investigate, identify and challenge those acting against our interests". Mr Javid said: "This is a necessary and proportionate response to the threat and will, of course, be subject to strict safeguards and robust oversight to assure its proper use." If the bill is passed, police, immigration and customs officers would be able to stop, search and detain anyone at a port, airport or border areas to determine if they are involved in "hostile activity". Home Office officials said the UK faces "a sustained threat from hostile state actors seeking to undermine national security in a variety of ways, including espionage and, as the attack in Salisbury made clear, violence against individuals". The powers are part of the Counter-Terrorism and Border Security Bill which would also "strengthen" police powers to investigate terrorism and increase the maximum penalty for certain offences. Mr Skripal, a former Russian spy, and his daughter Yulia collapsed in Salisbury city centre on 4 March after being attacked with a nerve agent known as novichok. She was released from hospital after six weeks of treatment while Mr Skripal was not discharged until May. Ms Skripal said she was "lucky to be alive" and hoped to return to Russia some day.